The very best teams are the ones where a large collection of diverse individuals come together, without resentment or hesitation, to become one unit with one set of goals. The nature of a large team makes this a difficult task. What’s even more challenging is that this formation into one team can force many players into the background or can stifle their individual talents. Even superstars want to have their individual needs recognized, to grow and improve, and to help on and off the field. This is doubly true of role and support players, especially those new to a team or still adjusting to their place within the squad. Is there still a way to help, nurture, and recognize individuals while focusing on forming one cohesive group? The answer is not more individualism, it’s actually more team: the creation of smaller units within the big one. Whether these are called pods, crews, squads, or buddies, they can be useful on any team—elite or summer league, college or high school. A crew is a group of about five to six players who can help each other mentally and physically, as well as provide emotional support, advice, and enthusiasm. A crewmate is someone who asks about your goals for the season, works with you on improving something, picks you up when you make a mistake, and talks to you when you’re on the field, knowing exactly what your strengths and weaknesses are. These crews need to be carefully and deliberately planned by team leadership, implemented early on in the season, and given their own identity. Then, the members within them need to work hard to keep them useful and relevant. Here is a two-part plan to make crews and keep them together. There are three basic tenets to forming a small squad within a team: location, role, and balance. Create sub-groups within your team based on a team based on location. This has several advantages, namely that this crew can easily complete pod workouts together, in addition working on other crew-related activities. Location really does allow for more time spent together. Crewmates will catch rides to and from practice together and inevitably talk about the team and their own play (who doesn’t?). Also, any kind of throwing, team workout, or film watching is easily accomplished without tedious travel times. Designating teams by location does have a few disadvantages. First, for teams setup in big (or very small) communities, location becomes much more meaningless. In a college town, for example, it’s really not that hard to get group members together, as they all live relatively close together anyway. On the other side of things, teams set up in big cities might have players scattered all over, making it difficult for truly strong geographical crew-making. Including out-of-region players, or those who live in other cities or nearby states, is can be quite difficult. Another disadvantage is that geographical location doesn’t always equate to chemistry. Players might like the same part of town, but be very different from each other, even though they are neighbors. Placing rivals or people who don’t gel well together is a no-no and once a few small exceptions are made, the entire consistency of a geographic system comes apart. Pods are easy to organize by geography, but they don’t necessarily have to equate to crews. You can have a training group and a support group; if anything, having both will only give players more chances to bond and be heard. A more common method of making crews is placing players with similar roles or positions together. Crews can be formed amongst handlers and cutters, as well as offense and defense. This makes a lot of sense. For example, an O-line handling trio will want to develop as much chemistry as possible. Their various strategies, techniques, and aspects of gameplay will impact each other often and there will be lots of good perspective to share. For example, a player on the same line will be able to really break down individual points, go over mistakes that led to failures, and improve working together well. Still, too much of this can also prove problematic. Sometimes a better perspective comes from the sideline or outside advice brings a new idea that hasn’t been tried. Having strong chemistry and communication with linemates is important, but it can also lead to a slightly unequal balance in crew support. A second D-line, for example, might have younger, rawer players. Creating a crew solely with role in mind will lump this group together and deny them the experience and advice of the leaders on the team. Compromises are often best. Place some role players together in the same crew, to work on the same things and to help teach each other. But, it’s also a good idea to have others in different roles actively contributing. The very best crews are balanced well, both geographically and by position. Many other factors can be also be balanced: age, style, humor, and interest in off-the-field activities, just to name a few. An older vet and a young rookie make a great pairing, especially in similar roles. A super hyped and intense competitor can help balance a calm introvert who thinks critically about every point, but often doesn’t voice it. Thinking about balance in this way, taking special care to separate potential conflicting players (as well as best buddies) is good for the team on multiple levels. It gives people a diverse group to help and to reach out to, while also encouraging new ideas and new chemistry. Remember the goals of these crews is to keep the team focused and running smoothly, while also making sure each individual along the way has a say and support. Establishing crews is half of the job. Just putting a collection of players into a group and telling them they have a sub-squad isn’t going to do much. The active members will still be active, the passive will still be passive, and not much will change. Here’s how to set up and keep that crew alive and well. The very best crews have lots of fun while still playing great ultimate. Start with the fun in these small groups. Each group should create a name and a theme. 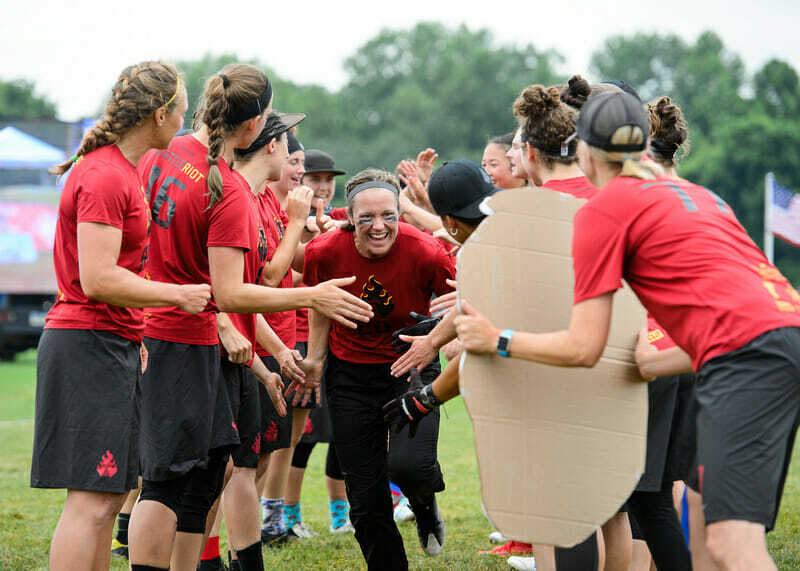 Ridiculous style and costumes, punny wordplay, and off-the-field shenanigans are highly encouraged, as well as a sense of competitive rivalry between crews. Funny in-jokes will abound, long car rides become chances to show off or rep a group, every party becomes a themed party, and practices immediately have small groups in any skill competition. Friendly wagers will keep things lively, and who knows how far GroupMe’s, Slacks, or Twitter or webpage will go in pursuit of the dream. Even the most humor-focused and fun-loving crew will need regular reminders to do the important tasks for the group, so have regularly scheduled check-ins. This could happen every other practice or once a week, but make it a point that the squad gets at least ten minutes to talk to their teammates. These are ideal moments for mental focus help and emotional support. Sharing hopes for improvement and need for help is critical. A really well-prepared team can have an assigned discussion question or topic for each crew member to share with each other. Ideally, these build well into the practice itself. If the focus is communication, members can explain how they best like to be talked to (or yelled at) on and off the field, and then this can be implemented into a practice on communicating with zone defense. Likewise with physical training, throwing, keeping cool in tense situations, and getting prepared for a big game. The possibilities are endless (just scroll through Tuesday Tips). The most important part of these groups by far, however, is the sharing and improvement of individual goals. Every player wants and needs help improving. Each player must share their goals for the season with their crewmates, and then these helpers must do whatever they can to give assistance, whether that’s motivationally reminding on a rainy day or talking about it with a person after the point. Crewmates can also help adjust goals if they’re too lofty or not challenging enough. There’s no better motivator to get in the gym then to have your entire squad text you to be there. Likewise, your forehand breaks will definitely improve if you have a better thrower working with you individually and then monitoring you during practices and games. If one part of the group improves, the whole group improves. Crews can also help each other out with a quick check-in before the first pull of a long weekend or an individual game. This is a chance to specifically say what each person may need to stay sharp. There are many little reminders in this huddle that can help: remembering to eat and drink water, throwing between games, staying loose when you haven’t played in a while, keeping mentally calm during a stressful play, recovering after a mistake, keeping spirited after a conflict, keeping egos in check after a triumph. Two minutes with a small group huddle can be just as effective as two minutes with the whole team discussing strategy and getting psyched to play. Last, but not least, is the advantage of targeted sideline reassurance. One of the best parts about a crew, and one of the best ways to keep one going, is to have specific voices on the sideline just talking to one player. In the chaos of game play, and the general cheering for the team, having one person keying on to your play is so important. It is ridiculous the difference on defense especially when someone is specifically telling you where to position, where the disc is, what the next threat will be. Having a dedicated sideline squad is the best way to ensure that this always happens. Rather than just picking a person at random, or more likely having people forget to do this entirely, simply say talk to your crew and keep it up. With some focus and preparation, the creation of small team groups or crews can be both extremely fun and extremely useful. It’s the best way to both keep the larger group focused on its main target, while also making sure there is a support team in place to help individual players. Use these steps, making sure to take time to keep the crews involved, and reap the benefits. Comments on "Tuesday Tips: How to Make Successful Team Crews And Keep Them Thriving, Presented By Spin"